Often times we take law enforcement investigation’s at face value. The general public does not understand the procedures associated with proper investigations and evidence collection. Although, errors are not intentional, we are all human, and we all make mistakes. Major crime scenes are very tedious, detail orientated, long hours, and human factors begin to take effect. Short cuts are taken, reports are not as thorough, and evidence is over looked-compromised – left behind- not photographed; the list goes on and on. This oversight in procedures could drastically effect the direction of a private investigation. These errors affect your livelihood! When the family is faced with the overwhelming, emotionally draining, task of trying to find the best resources for a loved one who has been accused and charged with a serious crime is often a blind effort. The first thing is to get an understanding of charges, the severity, and the sentencing guidelines that such charges have. The reason that this is important is simple. One can’t make an educated decision if they don’t know what they are making a decision on. The bottom line is you must take control of things and demand that your needs are met. In serious life changing cases, there is no medal for second place. There is one opportunity to make a first impression, you better make it count! We are approved through the Colorado Judicial Branch for court appointment. 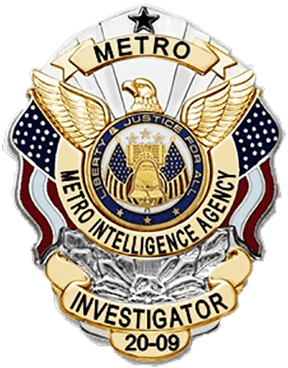 Metro Intelligence Agency will go over the Private Investigation process, because it is very important to know everything legally in a private investigation whether it is a Domestic Violence, Murder Scene Analysis, Robbery much more and look forward to answering any of your questions and please contact us .